SOUTH Coast based V8 racing crew MRTeam took part in their final state championship race of the season. MRTeam competed at Goulburn’s Wakefield Park Raceway on the weekend for Round 6 of the NSW Motor Race Championship. Competing in the Improved Production Over 2L division, the team was confident of a strong finish for the year. The completion of the weekend’s event was be a momentous one as drivers’ Ryan and Reece Marchello receive the final signature required in their CAMS log books to apply for their National Competition Licence. When MRTeam isn’t racing though, they are making a presence at as many festivals, shows and expos as they can. 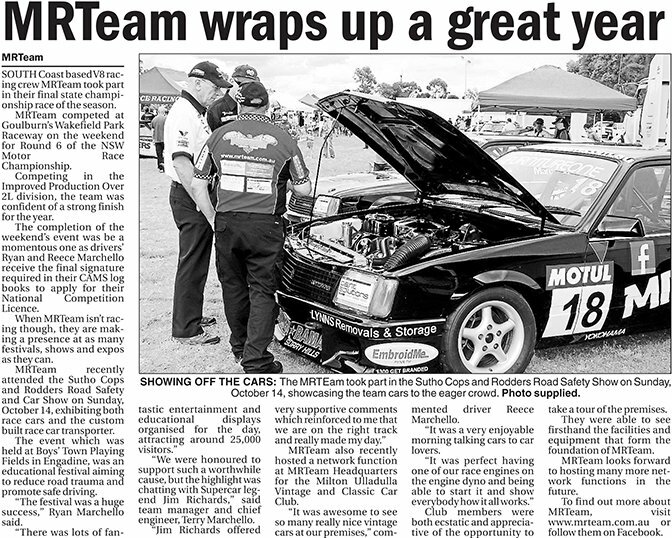 MRTeam recently attended the Sutho Cops and Rodders Road Safety and Car Show on Sunday, October 14, exhibiting both race cars and the custom built race car transporter. The event which was held at Boys’ Town Playing Fields in Engadine, was an educational festival aiming to reduce road trauma and promote safe driving. “The festival was a huge success,” Ryan Marchello said. “We were honoured to support such a worthwhile cause, but the highlight was chatting with Supercar legend Jim Richards,” said team manager and chief engineer, Terry Marchello. MRTeam also recently hosted a network function at MRTeam Headquarters for the Milton Ulladulla Vintage and Classic Car Club. “It was awesome to see so many really nice vintage cars at our premises,” commented driver Reece Marchello. “It was a very enjoyable morning talking cars to car lovers. Club members were both ecstatic and appreciative of the opportunity to take a tour of the premises. They were able to see firsthand the facilities and equipment that form the foundation of MRTeam. MRTeam looks forward to hosting many more network functions in the future.